[?](Question?) Stay Updated! Subscribe Now! How are strawberries grown, or produced--learn about the production of strawberries here. hill cultivation and matted row cultivation. Hill cultivation is primarily used in places where winters are mild. The plants grown this way are planted in raised "hills" of soil that are mulched with plastic and are watered using some form of drip irrigation. In this system, the plants are replaced annually (sometimes biennially) and any stolons (or "runners") that appear are removed, causing the plants to produce larger, higher quality fruit. 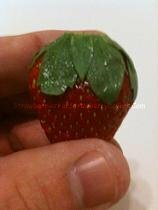 This method predominates in some of the most productive strawberry regions, such as the states of California and Florida, as well as Spain. Matted row cultivation is used with short-day varieties of strawberries in places where the winters tend to be quite cold. The plants are set into relatively flat ground, mulched with straw, and irrigated by sprayers. This system encourages stolons (or "runners") to form and start daughter plants, which in turn increases the number of plants contributing to fruit yields. Plants are only replaced every 3-5 years (when the plants become so old that their yearly productivity finally drops below economically acceptable levels). This method of cultivation predominates in the northeastern and midwestern United States. reduced manpower requirements for harvesting. Besides lessening the environmental impact of farming, and the production of high-quality, organic strawberries, all of these benefits of hydroponics could make strawberry farming more profitable, too. Nevertheless, hydroponics has remained a very minimally utilized method of production. Conventional strawberry cultivation remains economically viable at this time. Also, the initial time, training and money investments for switching to hydroponics are fairly substantial. As a result, many farmers simply don't consider converting their farms to hydroponic cultivation to be worth the current cost and effort. StrawberriesForStrawberryLovers.Com, Home of the World's Happiest Fruit! What do you think about this page? Leave a comment, and let us know! © 2009 - 2017 StrawberriesForStrawberryLovers.Com All Rights Reserved.